Posts on Twitter and other social media using the hashtag #BoycottNike began appearing not long after Kaepernick tweeted an image from the Nike ad campaign Monday afternoon. BEAUMONT — A Beaumont city councilman has joined many people around the country protesting Nike's use of Colin Kaepernick in their latest ad campaign by destroying their Nike gear and sharing it on social media. Posts on Twitter and other social media using the hashtag #BoycottNike began appearing not long after Kaepernick tweeted an image from the new Nike ad campaign Monday afternoon. Many posted photos showing them throwing away, burning or destroying their Nike gear. 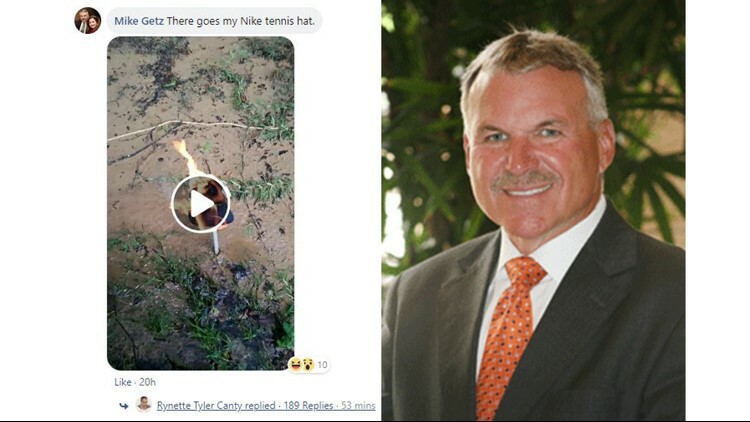 Beaumont councilman Mike Getz, who is an avid tennis player, posted a video of a Nike tennis hat in flames along with the comment, "There goes my Nike tennis hat." He posted the video as a comment on a post in a local politics group on Facebook, "JEFFCO POLITICS and MORE!" below a post that appeared to be in support of the Kaepernick ad. Beaumont City Councilman Mike Getz posted a short video clip of his Nike tennis hat in flames on Facebook. The former NFL quarterback was chosen as one of the faces in Nike's campaign to commemorate the 30th anniversary of its "Just Do It" campaign. Getz told 12News on Tuesday one of the reasons he does not support Kaepernick, or Nike's use of him in the campaign, is that he feels the workplace is not the place to voice your political views. He also told 12News that he was very disappointed in how the NFL had handled the issue of players kneeling during the National Anthem. Getz also mentioned his displeasure with a widely circulated photo of Kaepernick wearing socks that had cartoon pigs on them wearing police hats. He said he no longer watches the NFL and that now he won't be buying Nike products either. "If they're going to align themselves with Kaepernick, a person who, appears to hate the police based on what he chooses to wear, then I don't need to buy Nike apparel anymore," said Getz. Getz went on to explain that he supports Kaepernick's right to protest and speak freely, but doesn't think the workplace is the place for it. He believes Kaepernick's intentions were lost in the outrage of his actions. "Whatever kind of message he was trying to convey gets completely lost in the outrage that people see as a result of those actions," said Getz. However, those like Pastor Aaron Reynolds Jr. said Getz missed the message completely. "The protest is not about disrespecting the United States flag, it's not about disrespecting the National Anthem, it's about the injustices that have been done against blacks," said Reynolds. Like Reynolds, Louis Ackerman is excited to see Nike stand alongside Kaepernick's cause. "I think it sends a positive message to underprivileged populations really, that people who speak out in support of them are going to be rewarded for that," said Ackerman. Fredrick Davis on the other hand said he had family members fight for Kaepernick's right to protest. He, like Getz, doesn't think players should protest during the National Anthem. "I think he can find another way of protesting besides taking a knee to the National Anthem," said Davis. The ad drew both support and opposition and by Tuesday many also took to social media to compare the sacrifice made by former NFL star Pat Tillman. Tillman left the NFL to become a U.S. Army Ranger and was killed in a friendly fire incident in Afghanistan in 2004.